Prison health needs assessment for alcohol problems. Parkes T., MacAskill S., Brooks O. et al. What does the Scottish Prison Service need to do to adequately address alcohol problems among inmates? This needs assessment funded by the Scottish Government assesses the size of the problem, identifies the gaps, and recommends ways to plug them based on a review of relevant research. Alcohol problems are a major and growing public health problem in Scotland with the relationship between alcohol and crime, in particular violent crime, increasingly being recognised. The consequences affect individuals, their families, the health and emergency services, and wider society. The current policy context includes a strategic approach to enhancing the detection, early intervention, treatment and support for alcohol problems across Scotland, as well as efforts to reduce re-offending. This study is part of a wider alcohol research programme funded by the Scottish Government in criminal justice settings, which also includes a pilot of the delivery of brief alcohol interventions and a scoping study of alcohol interventions in community justice settings. It is anticipated that the study findings will inform broader health service development such as the integration of prison health care into the National Health Service (NHS) and the update of core alcohol treatment and support services. These developments are set within a policy and practice context which acknowledges alcohol problems in the population, and increasingly so, the alcohol problem in offenders, along with the importance of applying a person-centred, recovery-orientated approach underpinned by the NHS's commitment to quality of service. • Conduct a gap analysis between current service provision, best practice, effective interventions and national care standards for substance misuse. The study involved both quantitative and qualitative information being gathered through document retrieval and analysis as well as primary data collection. It was conducted according to ethical principles essential in research with vulnerable groups. The study benefited from internal research team advisers and an external project advisory group representing the Scottish Government, Scottish Prison Service, Information & Statistics Division and NHS Health Scotland. To ensure representation of other interests, such as prisoners and their families, two further organisations reviewed and commented on the draft report. A number of general trends in alcohol consumption and harm in the Scottish population can be noted from current evidence. There has been a rise in alcohol consumption over the past decades with a consequent rise in alcohol-related harms. A high proportion of the population drink excessively across all ages and socioeconomic groups, although drinking patterns and levels between groups and ages vary. Young men are the highest alcohol consumers and more likely to 'binge' drink. Scotland has the highest prevalence of alcohol-related health problems in the UK and among the highest in Western Europe. There is, however, emerging evidence that some specific alcohol-related harms may be stabilising in Scotland. The prisoner population in Scotland is younger than the general population and predominantly male. Data indicate a high prevalence of alcohol problems in this population among both men and women, and a higher prevalence of alcohol problems among remand than sentenced prisoners. A rapid review was undertaken to inform the primary research components of the study. Three screening tools were identified as having good reliability with offending populations, although no single screening tool was identified as superior. AUDIT was found to be most promising and is being used in several UK interventions related to offenders currently being evaluated. Several screening tools may be required for this diverse population. There is also some indication that timing of screening may be an issue, with very early screening post-imprisonment being relatively ineffective. The review also indicated that evidence is limited for most interventions in prison settings. In addition, many studies conflate alcohol and drugs making it difficult to identify specific alcohol-related outcomes. There is also a particular lack of published research from the UK, although several relevant studies are in progress. While there is evidence of the effectiveness of therapeutic communities, this is confined to people whose alcohol use supplements drug misuse, and studies report that they are costly and time-intensive. Brief alcohol interventions have the highest quality evidence base but effectiveness in this setting is still to be established. There is some evidence that addiction interventions have an economic benefit through the reduction of reoffending. Overall, there is a need for more research in the area of effectiveness of alcohol interventions in prison populations, in particular in identifying screening tools that work with this population, more information on what is effective, on the optimum timing for both screening and interventions, and the potential economic benefits of screening and interventions. As part of the study, for 12 weeks universal screening for alcohol problems was undertaken in a male prison, based on the AUDIT screening tool. 73% of prisoners had scores indicating a degree of alcohol problems (8+ AUDIT score), including 36% possibly dependent (20+ AUDIT score). The highest proportion of 20+ AUDIT scores were in the 18–24 and 40–64 age groups, but drinking patterns differed, with those in middle age more likely to show features of dependence than younger prisoners. Higher AUDIT scores were notable among those with shorter sentences (less than six months). This was a predominantly young population with a high prevalence of social exclusion factors, in particular unemployment and low education achievement, many of whom were on remand or short sentences. Over 1 in 4 reported their current offence to be a violent crime and four fifths had been in prison before. Alcohol was self-reported to be a factor in the offence in 40% of cases (50% for violent crime) and, of these, nearly half giving further information said drugs were also involved. A mapping exercise was undertaken of alcohol interventions across the Scottish prison estate, including the community interface. This was based on interviews undertaken with key informant stakeholders and staff members involved in alcohol service delivery across all prisons. Currently there is no formal alcohol screening using a validated instrument. A range of interventions are available to address alcohol problems in the context of offending but there is no alcohol-specific model of care. There was variation in capacity for addiction nurses to deliver interventions. Not all alcohol interventions are available to those on short sentences or remand (a large proportion of those with alcohol problems). Overall, the research found there to be limited accessibility to alcohol specific interventions, with far greater numbers accessing general substance misuse interventions. In-reach Editorial explanation: Helping agencies based in the community coming in to prisons to make contact with prisoners both to help while they are in prison and to try to engineer continuity of care on release. into prisons was also limited, although this was viewed as developing. Continuity of care is more difficult if a prisoner is released to a different geographic area. Alcohol interventions are being delivered by different providers in prison, so there can be limited awareness of overall service provision and care pathways among relevant staff. There is also a lack of outcome evidence and information to inform planning and service improvement. To give more depth to the study, a case study incorporating qualitative focus groups with prisoners and interviews with internal and external staff was undertaken in one prison. This found broadly convergent understandings of alcohol issues among prisoners and staff, both recognising links between alcohol and offending, including violent offending, and drug use. There was a general perception that alcohol interventions are not as well resourced or as prominent as drug interventions. Initial support is often limited and related to alcohol dependence and physical health needs, with few interventions addressing wider behaviour change and interrelated social problems. Staff also highlighted the challenge of delivering effective interventions for remand and short-term prisoners. Prisoners spoke about assessment of alcohol problems on admission as being a 'Yes or no' question, asked at a time of competing concerns and when taking in new information can be difficult. Key aspects identified were an empathetic approach and some separateness from the discipline regime. Prisoners also wanted more involvement of 'outsiders' and peers/ex-prisoners/those with experience of alcohol problems in the delivery of interventions. • That good assessment, including use of a validated screening tool, is necessary in order to ensure prisoners that need them are offered relevant needs-led opportunities to address alcohol. A model of care, or treatment framework, outlines the provision necessary to have a meaningful impact on prisoners with a range of alcohol-related needs. The findings of this study contributed to an enhanced understanding of the importance of implementing a full model of care in the Scottish Prison Service representing treatment pathways that address all four tiers in the Models of Care for Alcohol Misusers (MoCAM) guidance, with the Scottish Prison Service being viewed as a "treatment system". The planning and development of tiered interventions is an important mechanism in being able to better target and tailor interventions to prisoner need. The approach taken in creating the model of care was also informed by the principle of equivalence, whereby standards of health care for people in custody are the same as for the wider community. Outlined below are what is currently delivered in the Scottish Prison Service, where the gaps are and what is needed to fill gaps, drawing on the MoCAM model. TIER 1 In MoCAM, tier 1 consists of a range of interventions that can be provided by generic providers, depending on their competence and partnership arrangements with specialised alcohol services. • Referral of those requiring more than above for specialised alcohol treatment (to EACS). • Interventions offered that are meaningful to prisoners, are person-centred, meet their needs and are credible. TIER 2 In MoCAM, tier 2 interventions include provision of open access facilities and outreach that provide: alcohol-specific advice, information and support; extended brief interventions to help alcohol misusers reduce alcohol-related harm; and assessment and referral of those with more serious alcohol-related problems for care-planned treatment. • Mutual aid groups (Alcoholics Anonymous). TIERS 3 and 4 In MoCAM, tier 3 interventions include provision of community-based specialised alcohol misuse assessment, and alcohol treatment that is care co-ordinated and care-planned; tier 4 interventions include provision of residential, specialised alcohol treatments which are care-planned and co-ordinated to ensure continuity of care and aftercare. • Pre- and post-release work including community integration. • Emphasis on throughcare for all prisoners with identified alcohol problems. Alcohol care pathways are locally agreed templates for best practice that map out the local help available at various stages of a treatment journey for alcohol. 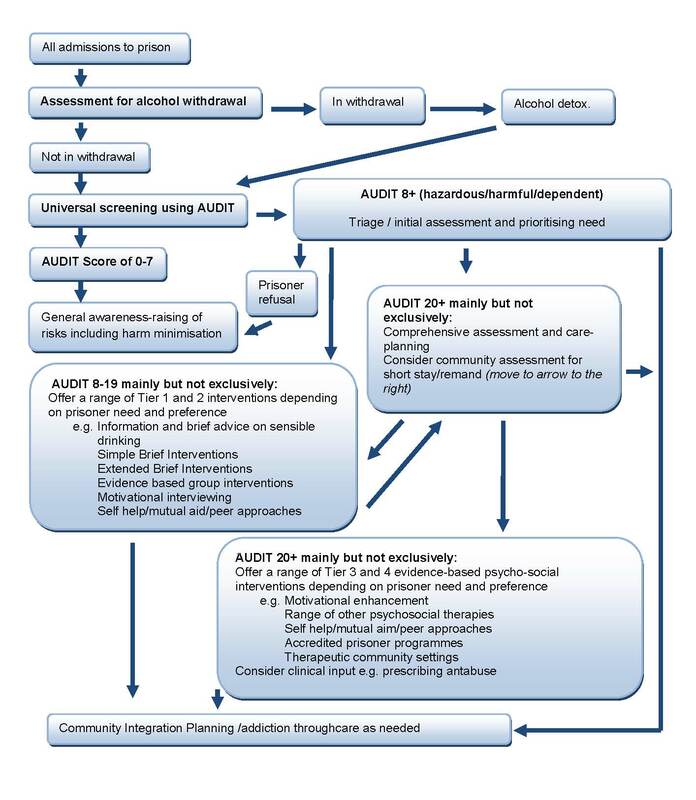 A flow diagram is outlined below showing the key decision points in a high level pathway of care that has been designed to be a subject for dialogue in local areas when planning and commissioning appropriate alcohol services for the prison population. Prison presents an opportunity to address alcohol issues among a particularly marginalised group of people. The prevalence of alcohol problems amongst prisoners in Scotland is far higher than in the general population. This study identifies a considerable proportion of individuals in the Scottish Prison Service who could benefit from interventions that address alcohol consumption and alcohol-related harm and while a range of alcohol-related interventions exist, many prisoners who could potentially benefit from such interventions are being missed. The planning and development of tiered interventions, based on detection with a validated screening tool and subsequent comprehensive specialist assessment when appropriate, is an important mechanism in being able to better target and tailor interventions to prisoner need. Integrated alcohol care pathways in the Scottish Prison Service are an important part of this process and likely to be best developed as a result of multi-level discussions amongst a range of stakeholders. Integration of the Scottish Prison Service and NHS health care services, due to take place in Autumn 2011, will be of particular relevance to the further development of this work. It is hoped that this report will add to current awareness of alcohol-related problems amongst individuals in prison in Scotland and contribute to building on the achievements made thus far. commentary This report complements a similar investigation of problem drinking offenders in Scotland and responses to them by community criminal justice services.